The Cosmetal River range of drinking fountains offer customers exceptionally high quality wall mounted and floor standing drinking water fountain options. Cosmetal has been producing the river range for over ten years and they offer customers a robust indoor drinking solution. 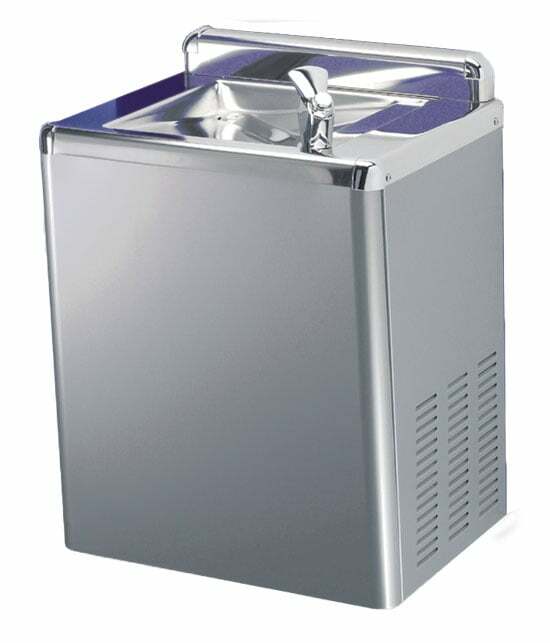 The ‘River Up’ range offers very robust and reliable high end wall mounted drinking water fountain. Clever direct chill technology gives you continuous filtered & chilled water. The wall mounted option also allows for an easy inclusion of water filtration. Wall mounted options are ideal when small children need to use the fountain or for wheelchair access. Water dispensed through bubbler at the front of the unit. Purchase options available by calling us on 0845 500 4455 . The Floor standing drinking fountains in the River range have been sold widely in the UK since their launch in 2004. Clever direct chill technology delivers high volumes of continuous filtered & chilled water. Use the drinking tap if you don’t have a glass or easily fill your glass or bottle from the curved neck tap. The River range of floor standing drinking fountains delivers up to 50 litres per hour. Purchase options available by calling us on 0845 500 4455.